It’s Throwback Thursday so let’s go back through Upper Deck’s trading card history and come up with a fun giveaway. The 2014 U.S. Open kicked off today in Pinehurst and Round 1 has had some phenomenal talent thus far. Circling around the top of the leaderboard is Matt Kuchar; with three birdies on the front nine, it is no surprise he is in this position. So let’s put up a throwback card and see if our fans can come up with some great captions for the card! Please share your comical caption to this card for your opportunity to score One (1) Pack of the NEW 2014 SP Game-Used Golf! You have until Friday morning, June 13 at 8:00 a.m. PT to post your caption before this promotion is closed. This would be much easier if I could use this like a pool cue. Are you too good for your home?!?!?! In my best Adam Sandler voice….. 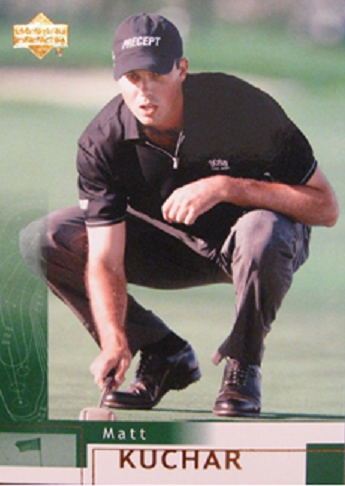 The Kuchar sets up outside calling for a curve. WHERE IS MY LEVEL AT? I see Tiger Woods doing this all the time… but I don’t see the point! Matt was teed off with his bad start, driving the ball almost beyond the green, but he was able to putt it behind him. Come on Chubbs! Of all the times and places for your arm to come of must it come off right in front of my hole in one?! All you gotta do is taaap it in…tap it in…just taaaap it in. Really, Tiger? You wanna play leap frog now? This one’s going in “Crouching Kuchar Hidden Dragon” style! So whom is/are the winner(s)? Sorry if you emailed them instead of posting on here. Congrats to Michael for scoring one (1) pack of the NEW 2014 SP Game-Used Golf! Thank you to everyone for participating and we hope to see your comments next week!